I feel like Jabba the Hutt. I spent seven days on the Cape (Cape Cod, Massachusetts) and ate all the food. All. The. Food. Cape Cod Potato Chips (when in Rome…): check! Pie – make that pieS – from Centerville Pie Company (It’s one of Oprah’s favorite things. How could I say no? ): check! Every carb known to man: check! Bottles on top of delicious bottles of rosé: most definitely check! And you know what? It was all totally worth it. OK, so I may have indulged a little and had a seven-day cheat day bender. But you can’t be on the Cape and not have fried seafood, or watch the sunset on a beautiful beach in Provincetown without a beautiful bottle of rosé. I’m not going to beat myself up for enjoying myself. What’s done is done. As nice as it was to eat like the world was ending, I’m ready for a good detox and getting back to my normal, less-indulgent ways. Don’t get me wrong, there will still be a cheat day this weekend, but it’s nice to have this balance. The first thing I made when I got home were these Tofu Summer Rolls. They are flavorful and refreshing and most importantly, I don’t feel any regret after eating them. 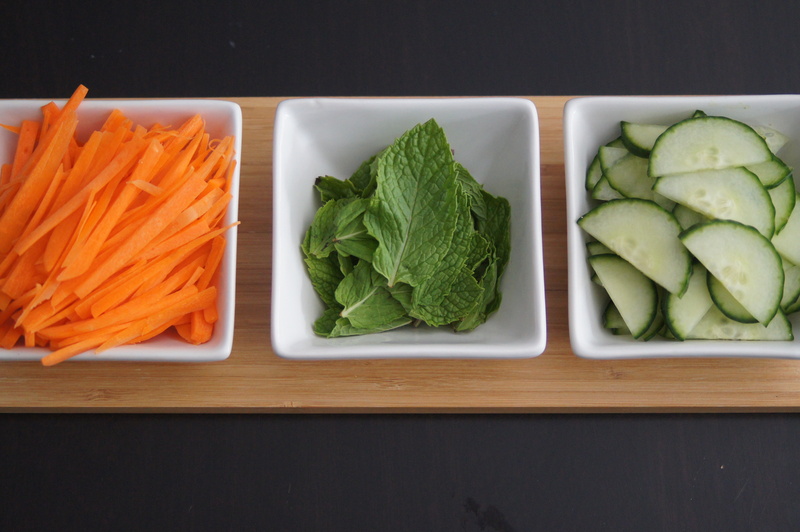 And look at how pretty the ingredients are! 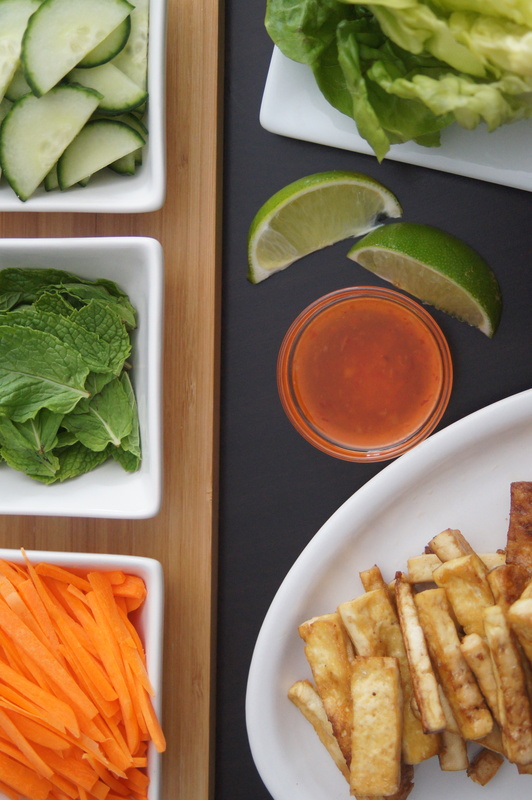 I used to bring Tofu Summer Rolls to work and it was never a sad desk lunch when I did. How could it be sad when I was eating something so colorful and vibrant in both looks and in taste? Sitting at my desk while assembling and eating these Tofu Summer Rolls were made better as I got caught up on my celebrity news (thank you, PerezHilton, E! News, and TMZ). And what made lunch at my desk even better was when no one would stop by and say, “Oh, you’re eating lunch. I just have one quick question” after taking a bite of the roll. These rolls are really versatile. If you don’t feel like using tofu, you can use rotisserie chicken or steak, or any other type of meat. If you have fresh, crunchy peppers you can use them too. I also like that you can have the tofu either warm or cold. Preheat oven to 400º. Place tofu on a paper towel-lined rimmed baking sheet. Top tofu with 2 more layers of paper towels and place a heavy skillet on top. Let drain 15 minutes. Remove paper towels and slice tofu into ½" batons. Toss tofu with soy sauce and grapeseed oil on baking sheet; season with salt. Roast tofu, tossing once, until golden brown, 20–25 minutes. Drizzle with sesame oil and toss to coat. 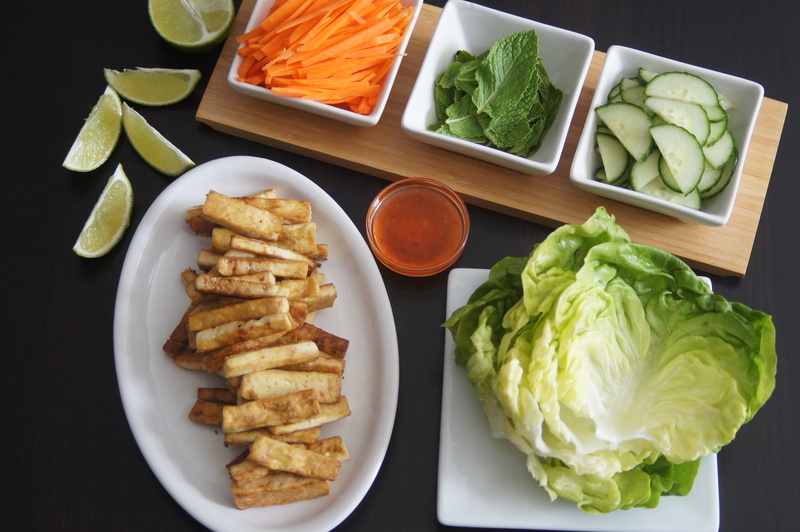 Serve tofu with lettuce, carrots, cucumbers, lime wedges, mint, and chili sauce alongside. Assemble just before eating. Do Ahead: Tofu can be roasted 2 days ahead. Cover and chill.